I have a couple of things to thank you for. First of all “Thank you” for all the support you gave to the bloggers who were trying to raise funds for the Queensland Flood Appeal. Together we raised a massive $99,089. What a great effort! Second “Thank you” for all the lovely comments about my Liberated Baby Quilt. I really enjoy reading your comments and appreciate your suggestions. My husband is one in a million. I know it sounds trite but it’s true. He does so much for me and asks for so little. So, when he mentioned in passing that he really would like a mug rug to take to work I couldn’t ignore it. 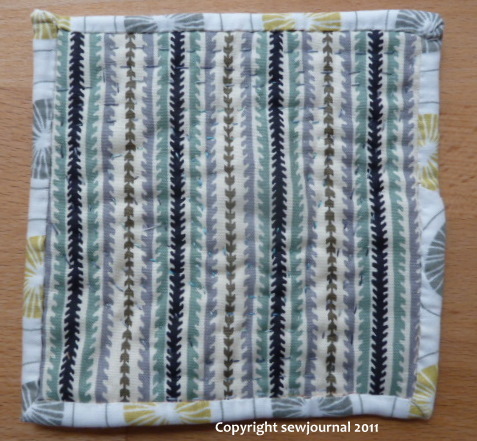 Yesterday I hand appliquéd, embroidered, quilted and bound this mug rug for him. I wanted it look masculine but not dull. Quite a tall order as many masculine looking fabrics use dull colours. For the front and back I used two fabrics from the Denyse Schmidt Hope Valley Fat Quarter Bundle in New Day that arrived recently from Hawthorne Threads. 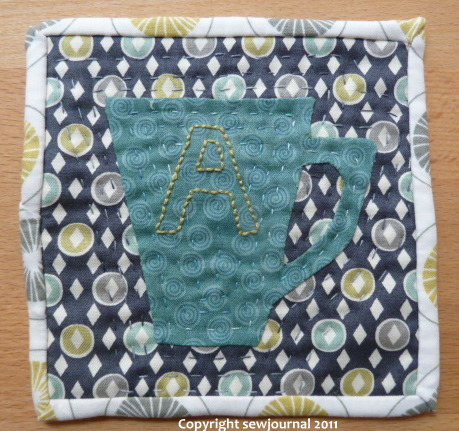 For the mug I used a lovely deep teal fabric that I bought from Patchwork Plus in Miranda and for the binding I used the Saffron Craig fabric that I got from Catherine’s Place. I have to say that binding something so small is quite a challenge even when done by hand. Anyway I’m happy to report that he likes it. Mission accomplished! You might want to try to just pillowcase it instead of binding for something that small. Your husband does sound like one in a million! (does he have a brother for me?? 8-]). His mug rug looks very masculine, indeed! I’m sure he will be the envy of all of his co-workers. Like I said before, any man who SUGGESTS stopping by a quilt shop and then sits patiently waiting while you are in there fondling the fabric, is a keeper in my book! I was privy to a special peak at your husband’s mug rug, what a proud husband you have! I wouldn’t be surprised if our other co-workers start placing their orders……….I must tell you, my husband tells his friends that I cut big bits of material up into little bits of material and then I sew them back together. My friend’s husband actually made himself a Tshirt with a needle and thread drawn on the front surrounded by a red circle with a red slash through it…just like a no smoking symbol….how rude!